When you're sick with a fever that won't go down or a case of the flu that has you feeling absolutely miserable, you're willing to just about anything to feel like yourself again. After all, you've got a life to get back to--and feeling sick isn't fun for anyone. The latest remedy? 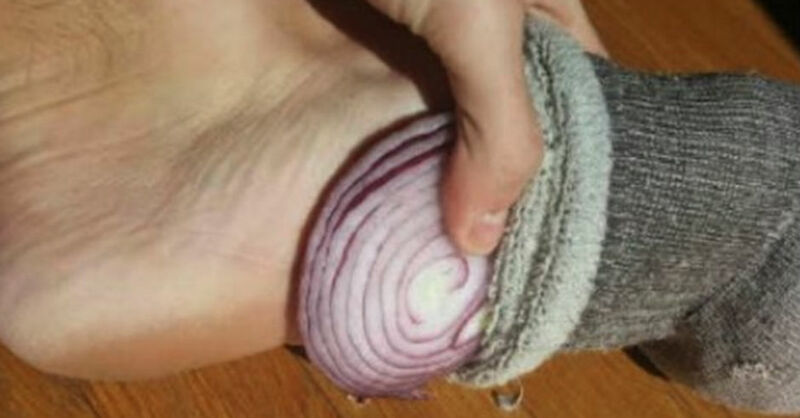 According to healthy living blogger Jennifer Thompson, the best way to get rid of a fever or flu symptoms is to tape an onion to your foot, cover it with a sock, and go to sleep. They aren't a cure-all, but they can certainly make a big difference! Removing some of these pathogens from the body can help ease flu symptoms and encourage faster recovery. While it's unlikely that this "miracle plant" will ever fully replace modern medicine, if you're feeling sick, it's worth a shot! Onions are inexpensive, and when you're sick, you mostly feel like sleeping anyway. Combine the two, and you just might have a miracle cure on your hands. Reports are certainly pouring in to approve the "onion trick." One woman tried it on her mother in the hospital when the doctors couldn't get her fever down. Another used it when a high fever had her severely uncomfortable. Using an onion might not cure everything that ails you, but it seems like it's definitely worth a shot!